I thought we had a deal with 2016? It takes what it wants and then 2017 doesn’t have to take anyone. And yet, this year we have already lost Mary Tyler Moore, Miguel Ferrer and now, Richard Hatch. I’ll tell you, I was pretty young when the original Battlestar Galactic was on. So, of course, the little boy and his robot dog were where my interests lay. But I saw it again as a teen and as an adult and I’ll admit, Starbuck was my guy. Who is surprised by this? No one? In both incarnations of BSG, Starbuck was my crush. But not the actor. (Not even when he was on the A-Team, though I admit a small phase of crushing on Faceman, even though Murdock was always, always my number one). 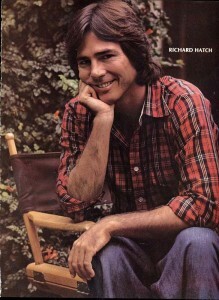 No, as far as actors went, I only started to know things about them as an adult and it was Richard Hatch I found to be the nicest, sweetest guy, especially when interacting with his fans. I used to watch this show that was part Auction House/part Hoarders, where people were hoarding collectibles and an appraiser would try to get them to part with some of it and then help them display/care for the rest of it, as you should a collection. In one episode, a man had a huge BSG collection - original and new. And he just couldn’t part with any of it. So they actually got Richard Hatch to come. He was blown away by the collection, but was also like, “Dude, that’s me, shoved in a corner. Don’t shove Apollo in corner, take care of him!” When he left, he hadn’t convinced the guy and he was so disappointed. But that - his disappointment - made the guy shape up and agree to let go of some it. In fact, they found a big empty room in the back of the comic book shop that he frequented. The comic book guys were basically like, “This dude keeps us in business, what if he stops buying stuff now.” So they made this deal with the guy to turn their backroom into a BSG museum, using all of his stuff. It would still belong to him, but it would help them generate business and everything would be on display and cared for. They did a Grand Opening of the museum and all the store regulars showed up to look at the BSG display. And so did Richard Hatch. He came to the grand opening and congratulated the guy, marveled at the collection. signed autographs, took pictures and he was so, so sweet. And that, that I think really shows the man for who he is. Who he was. That is an example of the man we lost this week. What a lovely, lovely tribute. I loved the original Battlestar Galactica! RIP Richard and thank you for an unforgettable character. So sorry to have lost Richard, too soon. On FB, is a convention organizer named Mitch Hallock. He would love this story, I bet. He mentioned that Hatch was always a great, friendly guy, and a great guest star at a con. He mentioned that Hatch was always a great, friendly guy, and a great guest star at a con. What a great story and a great way to remember him.